LAS VEGAS – The online registration desk for the 2019 winter edition of the Las Vegas Market (LVM) has opened. The twice-yearly trade event will run from 27 to 31 January will be held at the World Market Centre here and will offer more than 4,000 cross-category furniture, home décor and gift resources across three buildings and two pavilions. The portal can be found at www.lasvegasmarket.com/register. 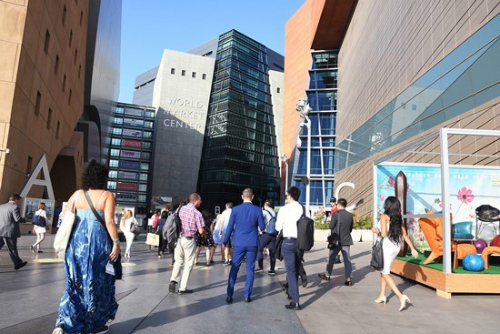 “Las Vegas Market offers buyers, designers and exhibitors an easy-to-navigate destination to launch new lines and discover the latest trends,” said Robert Maricich, chief executive officer of International Market Centers (IMC), the owners and operators of the market. “Las Vegas Market is the nation’s fastest growing gift and home décor market and the leading furniture market in the western U.S.,” he added. The organisers said market-goers will be offered a variety of special events and industry networking opportunities, including the 14th annual Las Vegas Market Design Icon Award, which honours an interior designer or architect who has made a significant contribution to the industry throughout his career while giving attendees an opportunity to connect with and learn firsthand from living legends. For the first time this January, LVM is partnering with Kite Trade Association International (KTAI) to bring 20 makers and designers of wind-related products to Pavilion 1, adding a new dimension to the market’s gift and home temporary exhibits. KTAI is a non-profit organization based in Oregon that exists to support and promote the manufacturing, distribution and retailing of kites and wind-related products. The co-location, which is KTAI’s first collaboration with a major market, will add to the 200+ toy resources available in three buildings and two pavilions at Las Vegas Market. Additional LVM-exclusive events include the 2019 Housewares Design Awards, which recognise design excellence in 11 core housewares categories, one SMART home category and a new Gourmet Specialty Foods category. During the industry event, the third annual Design Influencer Award will also be presented. Other highlights include product introductions in gift, home décor and furniture resources in both permanent showrooms and temporary exhibits. Introductions within the gift category include international, seasonal/garden, pet products and fashion accessories. Within furniture, there will be a focus on case goods, upholstery, casual/outdoor, mattress and bedding and hospitality. In home décor, new resources are expected in lighting, rugs, accents, wall décor and home textiles. Organiser also expect that all major mattress and bedding producers will exhibit at the January show, which in recent years has established itself at the largest mattress event in the United States. Temporary exhibits will showcase 500-plus new and returning gift and home décor exhibitors in six categories at The Pavilions, including a section devoted to antiques. Beyond products, LVM hosts a proprietary trend program called First Look, which features a curated showcase of products that reflect the diversity of styles, prices points and categories available at market. Buyers can also attend events, hospitality and product demonstrations designed for them as well as use onsite amenities, including campus and hotel shuttles, fully-equipped internet lounges, and convenient café and food kiosks. Its web site and app host an exhibitor directory and other planning tools to create and customise preferred exhibitor lists. Floor maps have been included in exhibitor profiles and integrated market registration details, including Scan & Go QR codes, are available to users who have created an account. Dates for the winter 2019 Las Vegas Market are Sunday to Thursday, 27 to 31 January. From Sunday to Wednesday, the permanent showrooms and temporaries on C12 and C13 will be open from 8am to 6pm, but will close on Thursday at 4pm. The Pavilions will be open from 9am to 6pm, and close on Thursday at 4pm. For more information, visit www.lasvegasmarket.com.